For many people who have retired from long careers, worrying about their online security may be something that fell off the radar when they left work behind. But online security at home is just as important as it was at work, only now you don’t have the “IT guy” to call. Even if you only rarely spend time on your computer, protecting your computer and other internet-linked devices and appliances can save your identity and your savings from being stolen. IRS/tax-related scams (#1 nationwide) work on the basis of fear and intimidation, even going so far as to threaten legal action if the person doesn’t pay back taxes. These scams often operate by requiring the person to wire money or send pre-loaded debit cards. 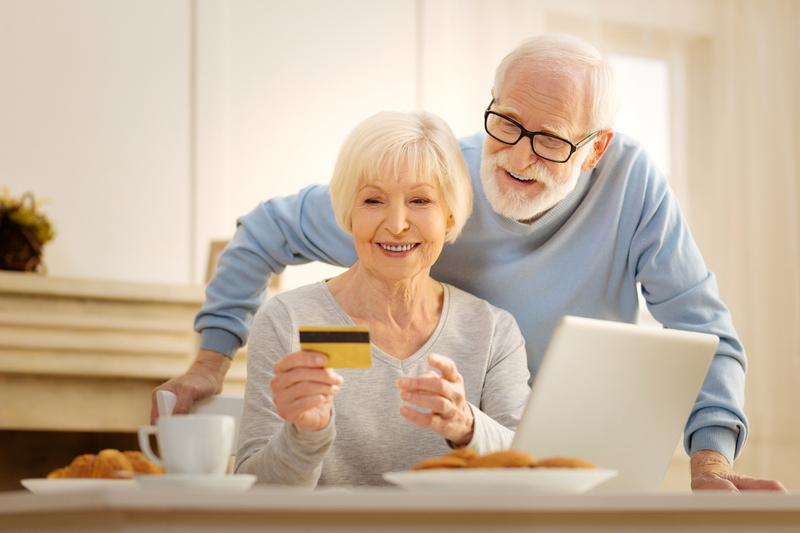 Sadly, despite the IRS constantly reminding us that they do not contact people via email or text messages, seniors continue to fall for this scam. In 2017, the IRS reported that 12,000 people lost a combined $60 million to IRS scammers. Solution: Do not respond to IRS emails or texts. Just delete them. Fake computer virus alerts telling seniors they have a computer virus take advantage of the average person’s lack of computer savvy and scare them into clicking on a tech support link. Once done, the computer is accessed and either information is taken, malware is downloaded and/or the person is told they must provide a credit card number for payment. Seniors continue to be taken in by this scam. Solution: If a malware or virus alert appears on your screen, do not click on it, delete it. Internet dating scams play on the elderly person’s loneliness to gain their confidence and trust over weeks and sometimes months. Then scammers exploit that trust by asking for money, which by then the victim is often happy to give. Solution: If you meet someone online, watch for the person to cite destiny or fate concerning your relationship, or profess eternal love but need money to visit you. They usually say they are from the U.S. but have to go overseas for any of a number of reasons, when, in fact, they have always been in another country. If any/all of these common threads appear, stop communicating immediately. In all scam circumstances, the activities should be reported to the authorities. AARP Elderwatch provides a comprehensive list of organizations and agencies to report to. Turn on your firewall and leave it on — A firewall can protect your computer from others gaining access. Some computers have them factory installed or you can purchase firewall software. Install antivirus software and keep it updated — Antivirus software prevents malicious software programs from entering your computer and will disarm or remove any that do get in. Install antispyware software and keep it updated — Antispyware software protects your computer from software that literally spies on you through your computer and lets others see it as well. Be sure to purchase software only from trusted sources. Update your operating system regularly — Operating system updates help your computer run efficiently and also eliminate security holes. Download with caution — Some e-mail attachments can get around even the best anti-virus software. If you receive an email with an attachment from someone you don’t know, delete it. Also be aware that your friends and family can be hacked and their email used to send malicious attachments and links. If something doesn’t look right, delete it. Keep your computer off when not in use — There is no better way to thwart computer attackers than to turn your computer off. It may be a little inconvenient, but it’s worth it if it stops just one hacker. It’s just been the last few years that the “internet of things” (aka IoT) has really taken off with internet-connected devices such as voice-activated speakers like Alexa and Echo, smart phones and watches, and even such appliances as thermostats and refrigerators, and home security system sensors, cameras and locks. The sky really is the limit with the internet of things, but while the internet of things connections we love make our lives easier, they may also make our lives more vulnerable. For starters, to do their jobs, devices gather, store and use data about us, and may also be providing that information to the manufacturer. Even your conversations with other humans can be recorded without you knowing it. And of course, anything online can be hacked. Internet of things devices may be especially vulnerable because they may not have software installed (or even the ability to have software installed) to protect them from intruders. What can you do to protect your smart home? Pay attention to passwords! An article by Travelers titled, “Password Security Tips,” is a great start to understanding the importance of passwords, how to create a good password, and how to keep a good password working for you. Also, pay attention to the manufacturer’s information about the products you choose, be sure to update devices and smartphones when new software updates become available and stay on top of technology news that could affect your devices and your lives. For more information about protecting your smart home, the MarketWatch article, “7 ways to keep your smart home from being hacked,” offers great insights for the novice and the expert. The internet has brought the world together, opened doors to knowledge, and made life better in many ways. But with the good comes the not so good, and at least for the foreseeable future, attention to online security is mandatory for peace of mind. Remember, every step you take to protect yourself is one more roadblock cyber thieves, scammers and hackers will have to overcome.